There was a great turnout at the School Board's first public hearing tonight. Forty-four people spoke and many more were in attendance. Very few speakers supported the Superintendent's proposed budget as-is. They wanted more. Around half of the speakers asked the School Board to NOT eliminate middle school library assistants. 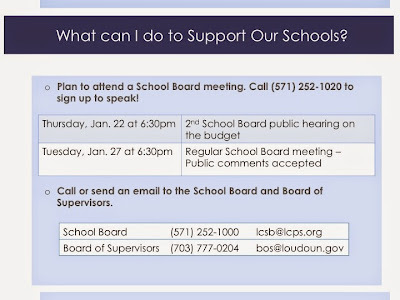 In the 1/15 budget questions & answers, LCPS staff admitted in its answer to question #21 that it would need a loophole to get around the state required standards of quality (SOQ) for staffing that mandates at least one full-time library assistant when a middle school or high school has over 750 students. Many speakers solely asked to keep the library assistants, but several speakers also made the point that LCPS needs to still restore the middle school deans. The Superintendent's presentation on the budget offered up the middle school library assistants to offset the increased expense of restoring some of the middle school deans. One teacher asked for new textbooks for her AP history classes. Her current ones are woefully out of date. After hearing that, one speaker, a former student of LCPS, said, "A lot's changed since I graduated in 2005. Apparently the history textbooks haven't." He was disappointed that we're moving backwards, and settling for getting closer to where we were five years ago. How about you? 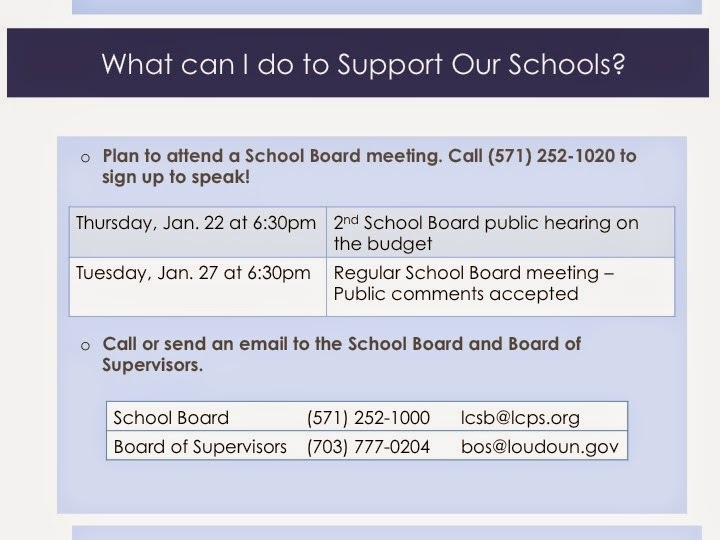 The second School Board public hearing on the proposed budget is Thursday, January 22 at 6:30pm at the School Administration building at 21000 Education Court in Ashburn. Call (571) 252-1020 to sign up in advance to speak or sign up at the door before the hearing begins. Thank you for another excellent summary. I hope you realize, despite what you may consider a lack of comments under your posts here, how extraordinarily helpful your work has been and continues to be. I rely heavily on what you do here and on Facebook, and I know many others do as well. So: thank you! I happened to post a blog entry myself, Why do Middle Schools Need Deans?, about the middle school dean issue. I would appreciate anyone with more extensive, relevant, or accurate information about their function and importance to add comments there or to otherwise step forward and get the word out on any public forum.